The Golden Gate Bridge showcases the caliber of techies in the 20th century. Engineer Joseph Strauss designed the bridge. In 1933, the officials started the Golden Gate Bridge construction. The Golden Gate Bridge was officially opened in 1937 to the public. Golden Gate links the San Francisco Bay with the Pacific Ocean. Tourists can easily identify the International orange color bridge. Engineer Irving Morrow suggested the bridge color as he thought that the traditional grey color was boring. The building cost of the bridge was $35 million. Once upon a time, Golden Gate Bridge was the tallest building in San Francisco. The twin towers anchor the single-suspension bridge and the towers reach the sky at 746 feet. Two cables over 7000 feet in length and both contain 80,000 miles of stretched wire over the tower’s top that are designed to support the suspended roadway. The golden gate bridge took over ten years of planning due to some opposition. But, the construction took only four years for a successful completion. The bridge brought the San Francisco and Marin counties communities’ closer. It has been the iconic landmark in the modern engineering. On the day of official opening, May 27, 1937, over 18,000 people crossed the bridge. More than 1, 20,000 cars cross the bridge each day. Wheelchair users, bicyclists can have sidewalks on the bridge in the daylight hours. One should not use Skateboards, roller blades and roller skates on the bridge. The tourists can enjoy seeing landscape points on the north and south sides of the bridge. Golden Gate Bridge withstood the earthquake Loma Pieta in 1989. Due to clumsy weather condition, the bridge was closed to traffic only for three times during its first 75 years. Most of the photographers around the world click the bridge as their prime work. Though the bridge has a sidewalk, it is a challenging task to cross the golden gate bridge. The bridge is 3 km long and it is about 220 feet from the sea level. In critical situations, the bridge can lean about 28 feet. The leaning makes the bridge less effective to external forces like earthquakes, strong winds. 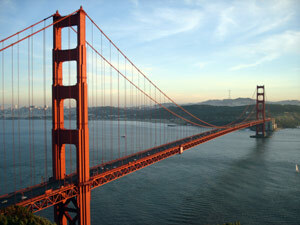 The Golden Gate Bridge is situated at the Presidio Park and the tourists, locals can reach the bridge by car or bus. But most of the locals like to walk in the evenings. Mist covers the entire bridge in the morning hours whereas golden gate bridge night lighting makes the bridge glorious. The popular California photographer Ansel Adams worried about building a sturdy bridge across the golden gate would ruin the beauty. But he changed his mind after seeing the completed bridge. During the bridge construction eleven men died, a safety net under the bridge had saved 19 workers. The Navy suggested painting the bridge in black & yellow stripes. The Army Air Corps suggested candy cane red with white stripes. After having a consultation with the great architect Irving Morrow, the bridge was painted in International orange color. The 1.7 miles lengthy six-lane bridge links San Francisco on the South side with Marin Country on the north side. At the time of replacing the Roadway in the 1980s, 12,300 tons was shed. Now the Golden Gate Bridge weighs 887,700 tons. Until 1964, the Golden Gate Bridge was the longest suspension bridge in the world level. But, now it holds the ninth position. Over 2 billion motor vehicles had passed over the bridge by 2015. 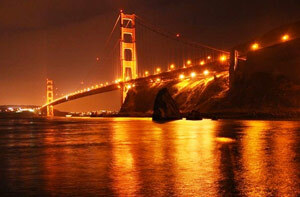 If you visit San Francisco as a tourist, then do not forget to add Golden Gate Bridge in your itinerary.